UK ticketing agency, WeGotTickets, approached Chaos in 2014 for a brand refresh. Following a successful rebrand, we continued with the design of a new responsive website for them. Their new brand identity was also applied consistently throughout their social media presence and eDM campaigns. 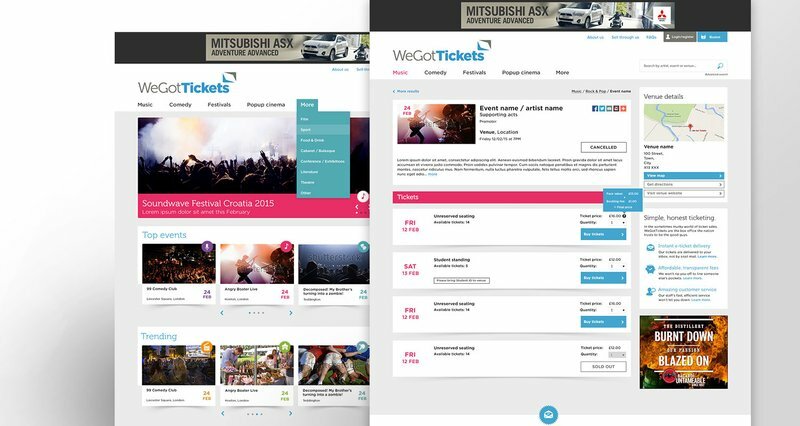 The first stage to approaching WeGotTicket’s new responsive website was to work out its site architecture. This gave us a clear structure for the website. We then scoped out the project in detail to ensure we captured all features required for each page and user journey throughout the site. We adopted a mobile-first approach for the website design and used wireframes to layout each page for mobile, tablet and desktop. The full website design was then created based on the wireframes.